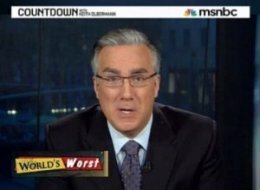 There is a double standard at work with regard to Keith Olbermann’s suspension, not only between other personalities appearing on MSNBC as commentators, but also at the very top level of the food chain. Comcast now owns is about MSNBC after their acquisition was completed earlier this year is approved (and it will be, I’m sure), despite protestations from many of us. A look at campaign finance disclosures for several organizations shows that Phil Anschutz, chairman of Comcast major shareholder and content partner with Comcast, donated large sums of money to the First Amendment Alliance, one of the largest outside groups targeting Democrats in the 2010 midterm elections. The Anschutz Corporation, wholly owned by Phil Anschutz, gave $50,000 on 9/24/2010 to the First Amendment Alliance. The two candidates targeted by the First Amendment Alliance? Jack Conway and Michael Bennet. Keith Olbermann gave to Jack Conway’s campaign along with Raul Grijalva and Gabrielle Giffords. In addition, the Anschutz family donated $169,900 to Republican candidates and committees during the 2010 election cycle, according to Open Secrets. Additionally, Comcast Corporation has contributed $125,000 to the Republican Governors’ Association in the 2010 cycle (as of 9/30/2010). That language clearly says “should” and not “must”. Further, anyone who thinks Keith Olbermann is an impartial journalist should have their head examined. He’s not, never has been, never will be, and is not presented as one. But it leaves this question lingering for me: How is it that the parent corporation of NBC and chairman of that corporation, Pat Buchanan and Joe Scarborough are accorded First Amendment rights to political speech and Keith Olbermann is not? Tea Party activists are riding to Arizona’s rescue in the state’s time of need. The efforts come in response to calls from progressives to boycott the state as a result of the controversial immigration law it passed last month. As we reported yesterday, the mayor of Phoenix has said the city faces a “near economic crisis” as a result of lost revenue. Gina Loudon, a St. Louis-based Tea Party leader, who helped get the Buycott off the ground and is tracking its impact, told TPMmuckraker that it likely has generated “hundreds of thousands of dollars,” in spending for the companies involved, but said she hadn’t yet had a chance to count the receipts she’s been sent. “The numbers are probably astounding, as soon as I have time to add them up,” she said. Arizona is under heavy fire from the left-wing bullies for trying to protect its own citizens from the ravages of illegal immigration. The entire state is being attacked as ‘racist,’ ‘nazi’ and ‘extremist.’ (Sound familiar?) The left-wing bullies believe they can target, isolate and neutralize Arizona, and thereby pressure the people of Arizona to stop enforcing the law. Both the Buycott and the rally were promoted in an email sent last night by the Tea Party Patriots, perhaps the largest organized Tea Party faction. * An earlier version of this post said incorrectly said that Rep. Raul Grijalva (D-AZ) called for a boycott of Arizona businesses. In fact, he called for a more limited sanction against conventions and conferences in the state.